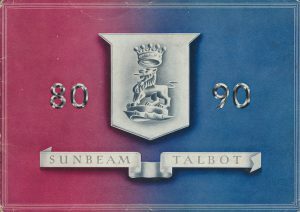 Introduced in June 1948, the Sunbeam Talbot 80 was Rootes first new post war design and the first Rootes car to be fitted with overhead valve engines. The 80 used an OHV version of Minx 1185cc engine, producing 47bhp. The separate chassis was derived from the 2-Litre, complete with beam front axle and semi-elliptic springs. The ‘Streamstyle’ full width body featured enclosed headlights, enclosed door hinges, ‘Opticurve’ curved windscreen and teardrop shaped rear wheel spats. The four-speed gearbox was operated by fashionable ‘Synchromatic’ column gear change. The 80 was available as a four door Sports Saloon and two door Sports Convertible Coupe. Production ceased in 1950 after 3500 had been built. Available as a Saloon or Coupe. Four-cylinder monobloc, overhead valves, special design detachable head and rocker cover. Steel-backed main and connecting rod bearings. Special type air silencer. Mechanical petrol pump. A.C. detachable by-pass oil filter. Three-bearing crankshaft, full-pressure lubrication. Three-bearing camshaft with harmonic cams. Down-draught carburettor with automatic choke giving easy starting-high performance and economy. Cushioned power engine mountings absorb any vibration. Cubic capacity: 1185 c.c. (72·26 cu. in.). Engine develops 47 b.h.p. at 4800 r.p.m. Coil and Distributor. Automatic advance and retard. 14 mm. wide gap, Champion plugs for improved ignition. Pump and fan, belt driven. Special selective system provides maximum cooling for the hottest parts of the engine, thus maintaining even running temperatures. Automatic thermostatic control. Borg and Beck single dry plate. Chain linkage to pedal. Proved four-speed gearbox with control ring synchromesh on top, 3rd and 2nd gears, and finger-tip lever on steering column. Overall ratios: Top 5·22:1. Third 7·78:1. Second 12·89:1. First 18·60:1. Reverse 24·85:1. Safety catch for reverse gear prevents accidental engagement. Semi-floating design with spiral bevel final drive. Ratio 5·22 :1. Complete box-section design of side members giving immense strength and rigidity. One tubular and three boxed crossmembers resist torsional deflection. Balanced ride suspension with automatic variation to load and road surface. Semi-elliptic springs have steel and rubber bushes which eliminate many greasing points. Suspension control is by Luvax Girling piston-type hydraulic shock absorbers. Five “easi-clean” disc wheels. Spare wheel and tyre housed in separate compartment under luggage boot. Dunlop extra low pressure, of large section. 5·50 × 16 in. Latest Lockheed two leading shoe system with hydraulic operation. Cast-iron 9-in (229 mm.) diameter brake drums. Handbrake operates mechanically on rear wheels. Burman worm and nut type with new style steering wheel, raked to give perfect control and comfort. 10 gallons (45 litres) capacity at rear of chassis. 12 volt, 51 amp. hours, Lucas battery housed under bonnet. Powerful starter operated by Solenoid button control on facia. Lucas ventilated dynamo with automatically regulated output. Two powerful flush-fitting sealed reflector headlamps with dipper control on steering wheel. Built-in fog and pass lamps. Built-in twin tail lamps, incorporating twin stop lamps operated by brake pedal pressure and twin reversing lamps operated by gear­chfoge lever. Independent illumination for rear number plate. Map reading light in cubby hole. Control panel has concealed lighting. Self-cancelling trafficators controlled by switch on steering wheel. Dual wind tone horns. Lucas twin-blade windscreen wipers with single master control. Roof light. Mechanical jack fitting into permanent sockets on chassis frame. Neat compact case of smaller tools, spanners, etc., contained in special locker in front compartment. Larger tools, including large tyre pump and jack, are housed in felt-lined receptacle in rear locker lid. Wheelbase … … … … 97½ ins. 2476 mm. Front track … … … … 47½ ins. 1206 mm. Rear track … … … … 50½ ins. 1283 mm. Ground clearance … … … … 5½ ins. 140 mm. Turning circle … … … … 36 ft. 11 m.
Unladen (with petrol and water) … … … … 2611 lbs. 1184 kgs. Laden (four passengers) … … … … 3213 lbs. 1457 kgs. Dry (without petrol or water) … … … … 2527 lbs. 1147 kgs. Unladen (with petrol and water) … … … … 2527 lbs. 1147 kgs. Laden (four passengers) … … … … 3129 lbs. 1421 kgs. Dry (without petrol or water) … … … … 2443 lbs. 1109 kgs. 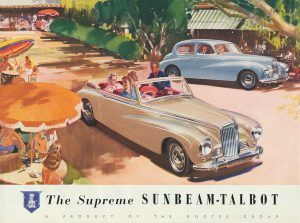 Introduced in June 1948, the Sunbeam Talbot 90 was Rootes’ first new post-war design and the first Rootes car to be fitted with overhead valve engines. 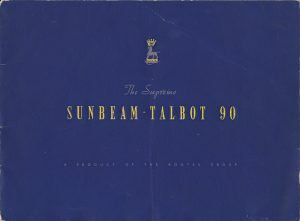 The 90 used an OHV version of the Sunbeam-Talbot 2-Litre engine, producing 64bhp. The separate chassis was also derived from the 2-Litre, complete with beam front axle and semi-elliptic springs. The ‘Streamstyle’ full width body featured enclosed headlights, enclosed door hinges, ‘Opticurve’ curved windscreen and teardrop shaped rear wheel spats. The four-speed gearbox was operated by fashionable ‘Synchromatic’ column gear change. The 90 was available as a four door Sports Saloon and two door Sports Convertible Coupe. 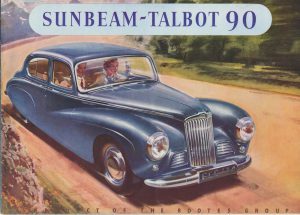 Production ceased in 1950 on the introduction of the Sunbeam-Talbot 90 MKII, after 4000 had been built. Four-cylinder monobloc, overhead valves, high-duty light alloy connecting rods, special design detachable head and rocker cover. Steel-backed main and connecting rod bearings. Special type air silencer. Mechanical petrol pump. A.C. detachable by-pass oil filter. Three-bearing crankshaft, full-pressure lubrication. Three-bearing camshaft with harmonic cams. Down-draught carburettor with automatic choke giving easy starting­high performance and economy. Cushioned power engine mountings absorb any vibration. Bore and stroke: 75 × 110 mm. (2·95 × 4·33 in.). Cubic capacity: 1944 c.c. (118·63 cu. in.). Engine develops 64 b.h.p. at 4100 r.p.m. Proved four-speed gearbox with control ring synchromesh on Top, 3rd and 2nd gears and finger-tip lever on steering column. Combined dip-stick and filter. Overall ratios: Top 4·3:1. Third 6·41 :1. Second 10·62:1. First 15·32:1. Reverse 20·47:1. Semi-floating design with spiral bevel final drive. Ratio 4:3:1. Balanced ride suspension with automatic variation to load and road surface. Semi-elliptic springs have steel and rubber bushes which eliminate many greasing points, and are fitted with special plastic grease-sleeves. Suspension control is by Luvax Girling piston type hydraulic shock absorbers. Five “easi-clean”, disc wheels. Spare wheel and tyre housed in separate compartment under luggage boot. All wheels are specially balanced. Dunlo extra low pressure, of large section. 5·50×16 in. Latest Lockheed two leading shoe system with hydraulic operation. Cast-iron 10-in. (254 mm.) diameter brake drums. Handbrake operates mechanically on rear wheels. Burman worm and nut type with new styled steering wheel, raked to give perfect control and comfort. 10 gallons (45 litres) capacity tank at rear of chassis. 12 volt, 51 amp. hours, Lucas battery housed under bonnet. Powerful starter operated by Solenoid button control on facia. Lucas ventilated dynamo with automatically regulated output. Two powerful flush-fitting sealed reflector headlamps with dipper control on steering wheel. Built-in fog and pass lamps. Built-in twin tail lamps incorporating twin stop lamps operated by brake pedal pressure and twin reversing lamps operated by gear change lever. Independent illumination for rear number plate. Map reading light in cubby hole. Control panel has concealed lighting. Self-cancelling trafficators controlled by switch on steering wheel. Dual wind tone horns. Lucas twin-blade windscreen wipers with single master control. Roof light. Unladen (with petrol and water) … … … … 2821 lbs. 1280 kgs. Laden (four passengers) … … … … 2821 lbs. 1549 kgs. Dry (without petrol or water) … … … … 2821 lbs. 1235 kgs. Unladen (with petrol and water) … … … … 2737 lbs. 1243 kgs. Laden (four passengers) … … … … 3332 lbs. 1513 kgs. Dry (without petrol or water) … … … … 2639 lbs. 1198 kgs. Introduced at the 1950 Olympia Motor Show, the Sunbeam-Talbot MKII featured new independent coil spring and wishbone front suspension with anti-roll bar. The chassis was redesigned and incorporated cruciform bracing and a Panhard rod at the rear. The engine was enlarged to 2267cc and now produced 70bhp. The front wings were redesigned with the headlamps raised and separate side lights. The passing and fog lamps were replaced with side grilles. The MKII was available as a four door Sports Saloon and two door Sports Convertible Coupe. 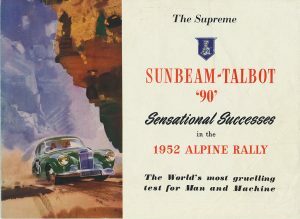 Production ceased in 1952 on the introduction of the Sunbeam-Talbot 90 MKIIA, after 9708 had been built. Four-cylinder monobloc, overhead valves, high-duty light alloy connecting rods, special design detachable head and rocker cover. Steel-backed main and connecting rod bearings. Special type air silencer. Mechanical petrol pump. A.C. detachable by-pass oil filter with renewable element. Floating filter oil pump intake. Three-bearing crankshaft, full-pressure lubrication. Three-bearing camshaft with harmonic cams. Down-draught carburettor with automatic choke giving easy starting ­high performance and economy. Cushioned power engine mountings absorb any vibration. Bore and stroke: 81 × 110 mm. (3.1875 × 4.33 in.). Cubic capacity: 2267 c.c. (138.2 cu. in.). Engine develops 70 b.h.p. at 4000 r.p.m. Overall ratios: Top 3.90:1. Third 5.811:1. Second 9.633:1. First 13.905:1. Reverse 18.564:1. Semi-floating design with Hypoid final drive. Ratio 3.90:1. Complete box-section design of side members giving immense strength and rigidity. Box Section crossmember and ‘I’ section cruciform resist torsional deflection. Independent coil spring suspension at the front and semi-elliptic springs encased in plastic grease sleeves at the rear. The Suspension is controlled by Armstrong hydraulic piston type shock absorbers, To eliminate roll and sway a transverse stabiliser is fitted to the rear and a torsion bar is fitted to the front. Dunlo extra low pressure, of large section. 5.50×16 in. Burman high efficiency variable ration type with 3 spoke steering wheel, raked to give perfect control and comfort. 12 volt, 51 amp. hours, Lucas battery housed under bonnet. Powerful starter operated by Solenoid button control on facia. Lucas ventilated dynamo with automatically regulated output. Two powerful flush-fitting sealed reflector headlamps with dipper control on steering wheel. Separate side lamps. Built-in twin tail lamps incorporating twin stop lamps operated by brake pedal pressure and twin reversing lamps operated by gear change lever. Independent illumination for rear number plate. Map reading light in cubby hole. Control panel has concealed lighting. Self-cancelling trafficators controlled by switch on steering wheel. Dual wind tone horns. Lucas twin-blade windscreen wipers with single master control. Roof light. Ground clearance … … … … 6⅝ ins. 168 mm. Unladen (with petrol and water) … … … … 2905 lbs. 1318 kgs. Laden (four passengers) … … … … 3500 lbs. 1588 kgs. Dry (without petrol or water) … … … … 2807 lbs. 1273 kgs. Unladen (with petrol and water) … … … … 2842 lbs. 1289 kgs. Laden (four passengers) … … … … 3437 lbs. 1559 kgs. Dry (without petrol or water) … … … … 2744 lbs. 1245 kgs. 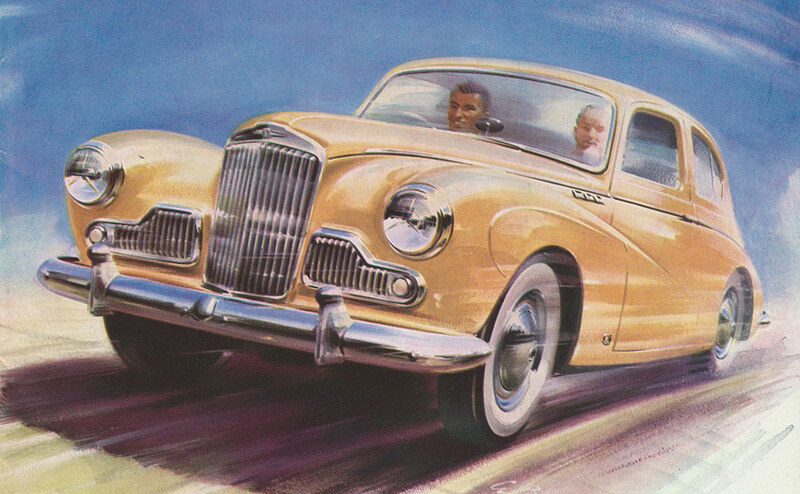 In September 1952, the Sunbeam-Talbot MKIIA was introduced with improved brakes and more powerful engine. The brake drum width was increased from 1¾ʺ to 2¼ʺ, increasing the friction area by 28%. To aid brake cooling, the wheels were changed to a new ventilated type with a smaller hub cap. The steering box was higher geared with 2½ turns lock to lock. In October 1953, the Alpine 7.42:1 high compression cylinder head was introduced which increased output to 77bhp. The MKIIA was available as a four door Sports Saloon and two door Sports Convertible Coupe. 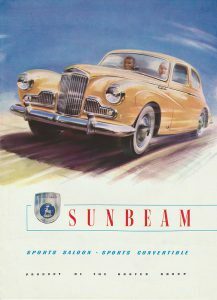 Production ceased in October 1954, on the introduction of the Sunbeam MKIII, after 5397 had been built. Bore and stroke: 81 × 110 mm. (3.1875 × 4·33 in.). Cubic capacity: 2267 c.c. (138.2 cu. in.). Engine develops 70 b.h.p. at 4000 r.p.m (late type 77 b.h.p at 4100 r.p.m). Overall ratios: Top 3.90:1. Third 5.811:1. Second 9.633:1. First 12.43:1. Reverse 15.74:1. Five “perforated”, disc wheels. Spare wheel and tyre housed in separate compartment under luggage boot. All wheels are specially balanced. Latest Lockheed two leading shoe system with hydraulic operation. Cast-iron 10-in. (254 mm.) diameter brake drums with extra wide brake linings 2¼ in. (57mm. ): cast iron cooling fins. Handbrake operates mechanically on rear wheels. 12 volt, 51 amp. hours, Lucas battery housed under bonnet. Powerful starter operated by Solenoid button control on facia. Lucas ventilated dynamo with automatically regulated output. Two powerful flush-fitting sealed reflector headlamps with dipper control on steering wheel. Separate side lamps. Built-in twin tail lamps incorporating twin stop lamps operated by brake pedal pressure and twin reversing lamps operated by gear change lever. Independent illumination for rear number plate. Control panel has concealed lighting. Self-cancelling trafficators controlled by switch on steering wheel. Dual wind tone horns. Lucas twin-blade windscreen wipers with single master control. Roof light. His Masters Voice Radio, Heater and Ventilating Equipment and Bumper overriders are available as optional extras. Overall length … … … … 167½ ft. 4254 mm. Overall width … … … … 62½ ft. 1587 mm. Unladen (with petrol and water) … … … … 2954 lb. 1340 kg. Laden (four passengers) … … … … 3556 lb. 1633 kg. Dry (without petrol and water) … … … … 2856 lb. 1295 kg. In October 1954, at the Olympia Motor show, the Sunbeam MKIII was launched. The MKIII featured a redesigned cylinder head with four exhaust ports and an increased compression ratio to 7.5:1 producing 80bhp. Laycock de Normanville overdrive was available as an option. The MKIII had revised larger front side grilles incorporating the side lights and 3 portholes at the top to the rear of the front wing to aid cooling. The interior featured new front seats with curved back rest and centre arm rest enclosing the handbrake. The dashboard was redesigned to provide an integral optional revolution counter. The MKIII was available as a four door Sports Saloon and two door Sports Convertible Coupe (until Summer 1955). Production ceased in December 1956, after 4952 had been built. Four-cylinder monobloc, overhead valves, high-duty light alloy connecting rods, special design detachable head and rocker cover. Steel­backed main and connecting rod bearings. Special type air silencer and cleaner. Mechanical petrol pump. A.C. detachable by-pass oil filter with renewable element. Floating filter on oil pump intake. Three-bearing crank­shaft, full-pressure lubrication. Three-bearing camshaft with harmonic cams. Down-draught carburettor with manual choke control. Thermostati­cally operated manifold system for rapid warm-up and easy starting. Cushioned power engine mountings absorb any vibration. Engine develops 80 b.h.p. at 4400 r.p.m. with 7·50:1 compression head. Pump and fan, belt driven. Special selective system provides maximum cooling for the hottest parts of the engine, thus main­taining even running temperatures. Automatic thermostatic control. Borg and Beck single dry plate. Chain and hook linkage to pedal. Gearbox. Proved four-speed gearbox with control ring synchromesh on Top, 3rd and 2nd gears and finger-tip lever on steering column. Combined dip­stick and filler. Overall ratios: Top 3·90:1. Third 5·811:1. Second 9·633:1. First 12·43:1. Reverse 15·74:1. Semi-floating design with Hypoid gear final drive. Ratio 3·90:1. Independent coil spring suspension at the front and semi­elliptic springs encased in plastic grease sleeves at the rear. The suspension is controlled by Armstrong hydraulic piston type shock absorbers. To eliminate roll and sway a transverse stabiliser is fitted to the rear and a torsion bar is fitted to the front. Five wheels fitted with styled nave plates, ‘slotted’ wheel discs and Rootes Group ‘Rimfinishers’. All wheels are both statically and dynamically balanced. Spare wheel and tyre housed in separate compart­ment under luggage boot. Dunlop extra low pressure, of large section, 5·50 × 16 in. Latest Lockheed two leading shoe system with hydraulic operation. 10-in. (254 mm.) diameter brake drums with extra wide brake linings 2¼ in. (57 mm. ); cast cooling fins. Handbrake operates mechanically on rear wheels. Burman high-efficiency variable ratio type with 3-spoke steering wheel, raked to give perfect control and comfort. Right- or left-hand steering is available according to market requirements. 10 Imperial gallons (45 litres) capacity tank at rear of chassis. Electrical System. 12 volt, 51 amp. hours, Lucas battery housed under bonnet. Powerful starter operated by solenoid button control on facia. Lucas ventilated dynamo with automatically regulated output. Two powerful flush-fitting sealed reflector headlamps with foot-operated dipper control. Separate side lamps. Built-in twin tail lamps incorporating twin stop lamps operated by brake pedal pressure and twin reversing lamps operated by gear change lever. Independent illumination for rear number plate. Control panel has concealed edge lighting. Self-cancelling flashing indicators controlled by switch on steering wheel. Dual wind-tone horns. Lucas two-speed windscreen wipers with automatic park mechanism. Roof light. His Master’s Voice Radio. Heater and Ventilating Equipment. White-wall tyres, Bumper overriders, Revolution counter, chromium plated fishtail for exhaust, and manually operated over­ride for automatic ignition. For details of the full range of Rootes Group Special Accessories apply to your Dealer. Full provision is made for the fitting of a Laycock-de Normanville overdrive unit. It is designed for use in top gear and is operated in conjunction with a final drive ratio of 4·22:1, giving an overall ratio of 3·28:1. Overall length … … … … 168 ft. 4267 mm. Unladen (with petrol and water) … … … … 3024 lb. 1373 kg. Laden (four passengers) … … … … 3626 lb. 1646 kg. Dry (without petrol and water) … … … … 2924 lb. 1327 kg. Where two-tone colour schemes are quoted the first colour is the upper body colour and the second the lower body colour.